Like some kind of massive, uber-budgeted, city-wide set of a Ridley Scott film that takes place after the fall of mankind, several cities built by China are almost completely devoid of life. What’s even stranger is that these massive cities continue to be built even though hardly a single living thing is taking up residence in them. 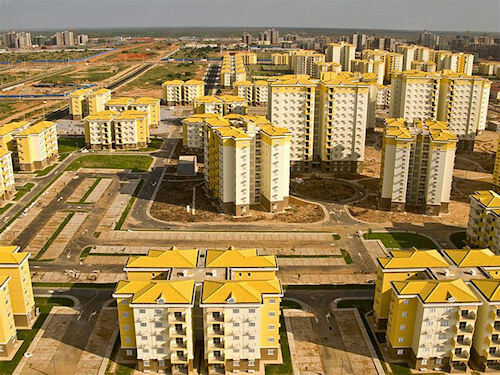 Recently an entire Chinese-built city in Africa popped up on everyone’s radar because of its sheer size. 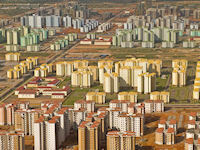 Named Nova Cidade de Kilamba, this massive city covers 12,335 acres, contains 750 eight-story apartment buildings, 12 schools, more than 100 retail units, is designed to hold an estimated 500,000 people and was built in less than three years for a hefty 3.5 billion dollars. 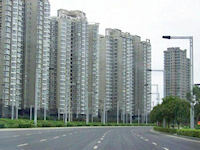 At the current build rate as many as 20 of these ‘ghost cities’ are being constructed every year with currently as many as 64 million vacant homes left empty. These cities aren’t being built in people-friendly locations either…one of them is actually built in the middle of a Mongolian desert. 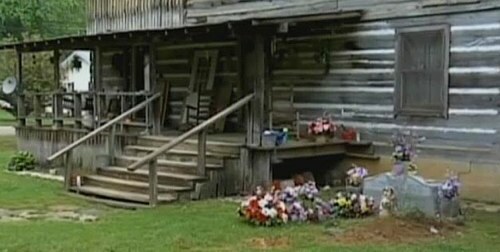 A man has lost his valiant fight to keep the government out of his front yard… where he buried his wife. James E. Davis buried his wife Patsy there after she died in 2009. What followed was a three year battle with the city after his permit to legally declare his front yard a private cemetery was rejected. …the Stevenson City Council voted to deny Davis’ application, citing concerns of the perpetual care of the cemetery, location and size of the small lot, impact of the cemetery on property values and citizens’ complaints with the location of the cemetery. There were also concerns about future liability of the city to maintain the cemetery. Davis has 30 days to appeal and was ordered to pay court costs. The Obama administration has formally responded to an online petition signed by over five thousands respondents demanding the acknowledgement of alien visitation. “The U.S. government has no evidence that any life exists outside our planet, or that an extraterrestrial presence has contacted or engaged any member of the human race,” said Phil Larson from the White House Office of Science & Technology Policy, on the WhiteHouse.gov website. But don’t get soured on the White House’s new petition initiative. You can always sign on to the ““We Demand a Vapid, Condescending, Meaningless, Politically Safe Response to This Petition” petition. It is the dawning of the computer age and anything is possible. Computations are reduced to milliseconds, data which previously required warehouses and staffs for maintenance can now be stored and sorted with ease and in Santiago, Chile a few very ambitious fellows assumed that these breakthroughs could solve a larger problem. They were going to take the Chilean economy out of the greedy hands of humans and the capitalist influences that corrupt them. After Salvador Allende was elected as the first socialist president in the country’s history, he began to nationalize large chucks on the economy including local branches of out-of-state corporations. Many companies that were not nationalized, fled Chile leaving infrastructure (machinery, warehouse space, trucks, employees) behind for the government to take over. The room you see above was HQ to Cybersyn, a project designed by British research scientist Stafford Beer where telex machines fed raw data into a custom designed program which would in turn create projections and issue guidance on further production and distribution to the newly nationalized factory. It was all controlled in the room pictured above. Boxy, plastic swivel chairs which one could easily picture a subordinate to Admiral Ackbar toiling away in dot the center while glowing panels displaying data ring the walls. Problem was, by all accounts, it didn’t work. While some declare it to be a forgotten, neglected seed that could have flowered into an egalitarian “socialist internet,” most of the evidence states that not unlike the data display wall mounts (which were non-functioning stage props) the entire project never lived up to its lofty goals. To put it in perspective, economist Alex Tabarrok points out that the IBM 360 units used in Cybersyn are considerably less powerful than an iPhone. 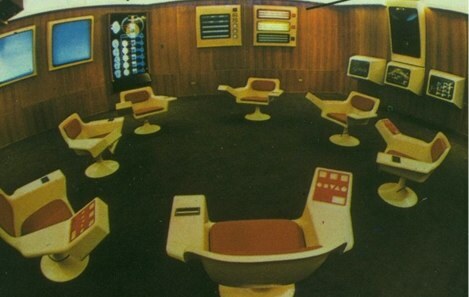 In this excellent 25-minute video essay about the Cybersyn, authors Jeremiah Axelrod and Greg Borenstein argue that the intentionally futuristic design of the control room was so effective at swaying Allende and his government into believing that the future was now and Cybersyn could be successful that it ultimately doomed the project. When 1973 came and the military coup by Augusto Pinochet deposed Allende from office, Cybersyn was shuttered and the telex machines mothballed. As for those chairs, the world may never know. 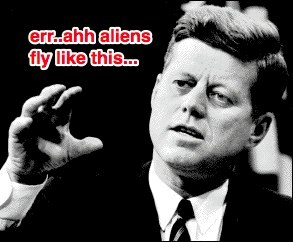 Recently declassified documents have stirred up one of my absolute favorite conspiracy crossbreeds: JFK was killed as part of a UFO coverup. More specifically, a new book claims to have found actual paper trail on communication Kennedy had with the USSR about UFO sightings. “One of his concerns was that a lot of these UFOs were being seen over the Soviet Union and he was very concerned that the Soviets might misinterpret these UFOs as U.S. aggression, believing that it was some of our technology,” Lester told AOL News. “I think this is one of the reasons why he wanted to get his hands on this information and get it away from the jurisdiction of NASA so he could say to the Soviets, ‘Look, that’s not us, we’re not doing it, we’re not being provocative. 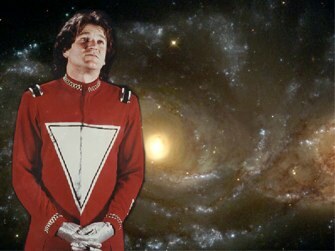 In fact, just to show you that it’s not us, what do you think about us working together on the exploration of space? '” Lester added. 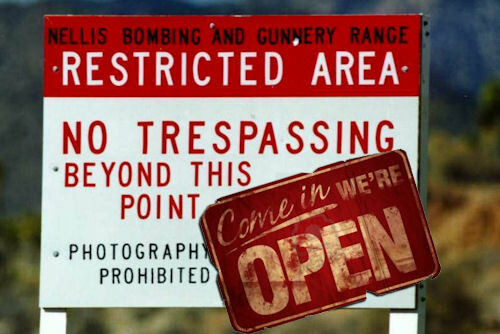 Of course many sightings of UFOs on American soil have been widely rumored to be low-flying Soviet air craft. Assuming the same might be true in reverse, was ol’ JFK trying to throw an alien smokescreen in the eyes of our Cold War nemesis? 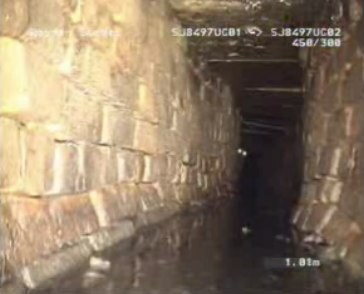 The northwest English town of Cumbria has a mysterious bipedal creature in the sewers. It may or may not be dangerous, but it does bear a resemblance to the infamous CHUD creatures from the 1984 horror film. Or at least that’s what the local government would like you to believe. A series of videos were published today showing the creature caught on an automated sewer robot camera. Although the videos themselves are not marked as such, they were apparently created by the local water council. They would like to remind citizens that flushing some items down the toilet can do serious damage to municipal pipes. Rose Francis, the campaign manager said: “The real monsters lurking in the sewers are the baby wipes, cotton buds and nappies which clog pipes. And so to do this, the created a completely unbranded cryptid video that will no doubt surface in two years as “absolute proof” of CHUDs in some other town. Crystal clear message.